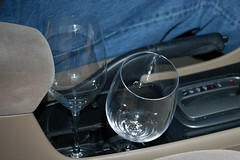 This photo does not condone drinking and driving. However, it does condone taking goofy photos while tipsy from your engagement photo shoot at a winery. Is Walt Disney World’s Magic Kingdom the happiest place on earth? Matte and I sure think so! Those of you who read Four Feet More, my friend Jenni’s blog, may know that she and her family are also here at Disney World. I was so happy to learn they’d be here at the same time as we are because I told Jenni long ago that I wanted to witness Vika and Eamon’s first trip to Disneyland. But Disney World is even better! We had plans to meet up with them near Cinderella’s castle around 5 p.m. Since both Matte and Jenni’s husband Jeff are photogs, the plan was to have a little photo shoot at the Rose Garden, with the famous princess’ humble abode as our backdrop. Jeff would take shots of Matte and me, and Matte would take shots of Jenni, Jeff, Vika, and Eamon. Once upon a time, I had a really good first date. As with most first dates, I was nervous as I anticipated his arrival. Well, not nervous as much as anxious. For some reason though, this one was different. As soon as he picked me up, the anxiety subsided. The unfamiliarity was still there, but it was so easy to be around this guy. Before he picked me up, I remembered that he was cute, but I kept wanting to look over as he drove, to make sure I was right in my initial impression. I didn’t need to stare too long and come across as some freaky gawking girl. I was right. He was cute. He took me to Palo Alto for dinner at a cute little Italian place, the kind of place where the tables are placed close together. Thankfully we were practically the only ones there, so we didn’t have the eyes of other diners upon us, hanging on our every first-date word. “Do you have any siblings?” “Where did you go to school?” “What kinds of things do you like to do?” and other fascinating questions that make up the conversation. Honestly, I don’t remember what we talked about. All I remember was he was easy to talk to. And he held the door open for me. And he liked good wine and chewed with his mouth closed. These are all plusses in my book. Part of the Stanford Theatre’s charm is the pipe organ onstage, offering pre-show entertainment that you just don’t get at the large cineplexes. The organist was playing Someone to Watch Over Me when we walked in. I remember this. The movie was very sweet, as only classics like that can be, and I decided then and there to pay more attention to AMC and to add Cary Grant to my TiVo wishlist. I don’t recall the conversation on the ride home, but I knew I wanted to see him again, and soon. I mentioned something to that effect, without sounding like some sort of desperate loser, and I gave him a hug good-bye. Yes, I sound like a prude, but this night was just too sweet to ruin it with a botched attempt at a first kiss. Besides, Mom always taught me to play hard-to-get. That date was one year ago. And tonight I’m going back. Same restaurant. Same movie theatre. Same cute guy. Yesterday in the mail, I received a card from someone I knew long ago. Oh my gosh, was he adorable back then, and he was quite enamored of me as well. In fact, he asked me to marry him on more than one occasion. He wasn’t working at the time, and was still tyring to figure out what he wanted to do with his life. He had very high aspirations. He was considering becoming a firefighter or perhaps a scientist or doctor, I can’t really remember. Looking back, it was best for both of us not to jump into marriage and although I was flattered to be asked, I just couldn’t accept. Over time I became very close to his family, and with my family out in California, his family quickly “adopted” me, and I become part of their large brood. His mother even got me a job at the University of Kentucky. Although many miles separate us today, I look back on that time with fondness and cherish the memories we created. I’ve visited Lexington since moving back to California, but the last time I was there, I didn’t get a chance to meet up with him or his family. My visit was too short. The card he sent was to thank me for the gift I sent him last week. He graduated from high school in May. Holy crap, do I feel old. I’m going to the jeweler’s to get my NEW engagement ring sized! Pictures and scoop later. I’m too excited to gather my thoughts right now! “because it’s got naked women in it! look, I like naked women! I’m a bloke! I’m supposed to like them! we’re born like that. we like naked women as soon as we’re pulled out of one. halfway down the birth canal we’re already enjoying the view. look, it’s the four pillars of the male heterosexual psyche. we like: naked women, stockings, lesbians, and sean connery best as james bond. because that is what being a bloke is. and if you don’t like it, darling, join a film collective. the boy’s reaction to the speech was a raucus applause, similar to the blokes sitting at the dinner table on the tv. I believe the message was lost on me, completely. I stopped listening at “I want to spend the rest of my life…” as did susan, steve’s girlfriend of two months.